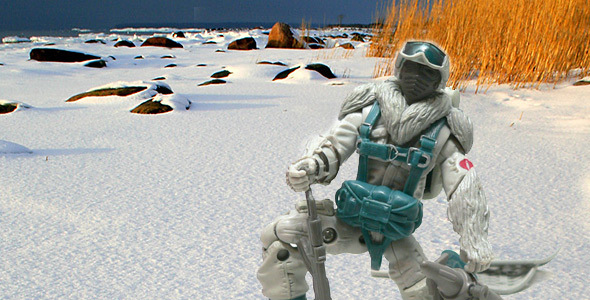 I’ve always loved cold weather action figures. It might have something to do with the fact that I grew up above the “Brigde” in Michigan. Living on Lake Superior, I saw my share of snow. That’s probably why I could relate to figure like the Hoth Han Solo and the original Snowjob. A setting of snow and ice was pretty easy for this young nerd to grasp. 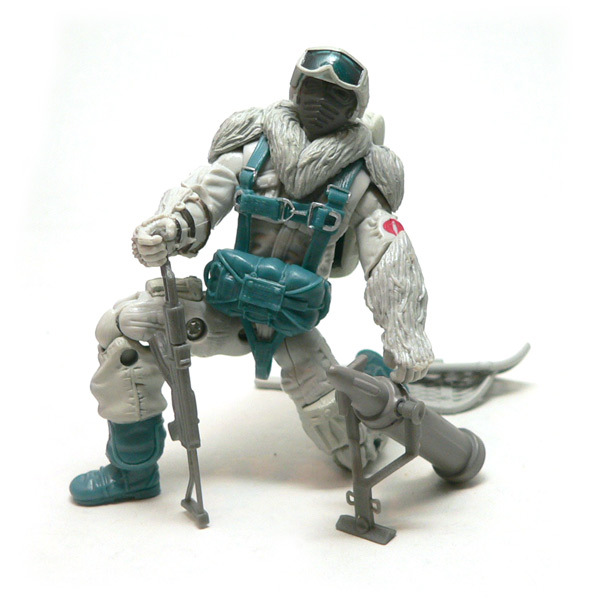 The original version of the Snow Serpent came out after my youthful toy collecting was over. Like a number of other GI Joes that I’ve purchased in recent times, I’m just filling in gaps in my collection. I did some looking around on the net of the vintage version of this character, and I have to say, for the most part, this is a pretty decent update. He’s a true update and not a new take on the character. 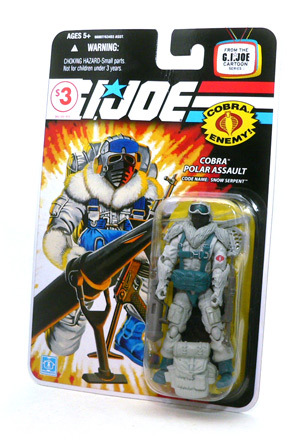 If it wasn’t for the Cobra emblem on the left arm, I would almost think this is “Polar Assault” Snake Eyes. The covered face with goggles on the helmet may be true to the original, but it looks cheesy. 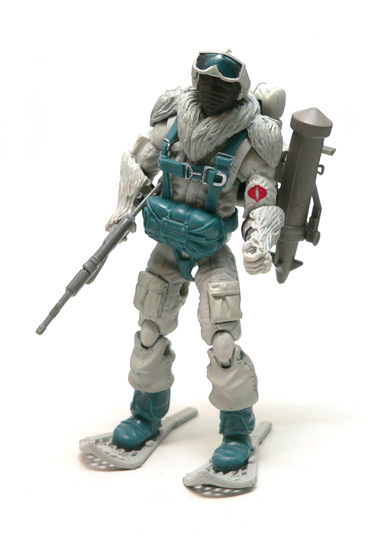 Speaking of cheesy, I’m not a huge fan of the blue on this figure, while not the worst color for arctic camouflage, it’s still a bit bright for a combat troop. The blue mainly comes from his web gear and back-up chute. The buckles on the webbing are detailed nice with some silver paint, but I think they could have used just a touch on the pull handle for the chute. It’s a pretty nice piece, though. Covering his shoulders and neck is a fur collar piece that is removable. Artificial or real this can keep you warm in really cold weather. The piece only slightly hampers his arm movements and is a great improvement on the original’s look. The fur collar is tied stylistically to his fur gauntlets. I can see the collar, but I’m skeptical about these. 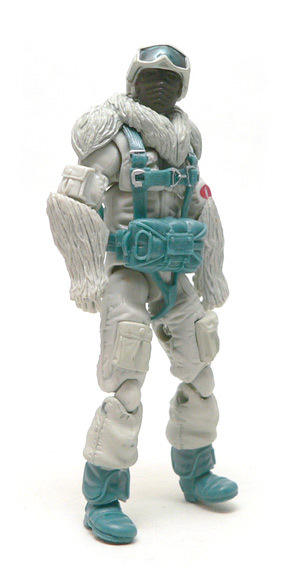 They seem to be more for making him look Yeti like and less like functional gear. It would have been nice if these pieces were removable like the collar for if you wanted a slightly more realistic look. Overall, the look works pretty well. He’s a paratrooper in grey. The jumpsuit is fairly nondescript as any generic soldier should be. The head is a helmet that reminds me quite a bit of an X-wing pilot helmet. The boots are fairly odd to me. I would expect them to be more of the “bunny boot” style, but these have an odd cuff to them that I don’t quite get. I’m sure they’re based on something real, but I’ve just never seen what it is. Once again, I’ve been tempted by a figure with a large amount of gear. It’s my weakness. Getting around in snowy conditions takes a lot gear. 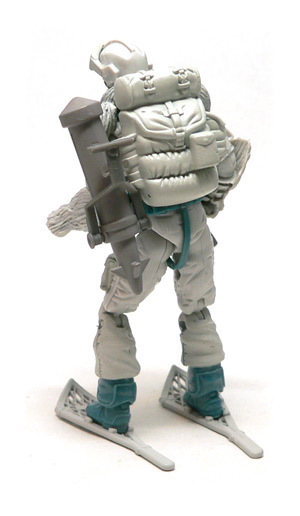 The requisite soldier backpack is well sculpted and looks like it should. There’s a bed roll looking thing at the top and the rest looks well padded. On the left side, there is a block for attaching the rocket thing. The rocket thing, appears to be some sort of small rocket/missile thing with and a mortar type launcher. I was a bit surprised that the rocket wasn’t removable or even spring loaded for that matter. It does have a movable leg for setting the angle of attach though. For moving across snowy fields SS here is equipped with snow shoes. To me this makes more sense than skis. They’re smaller and would give you an advantage moving through a wooded area. Snow shoes work by distributing your weight over a larger area than normally covered by your foot. As such, they work great at distributing the weight of the figure to allow it to stand without included base. However, even with that advantage, this figure fully loaded has a balance issue. I had trouble getting him to stand in a with the rocket attached to the pack. To me the figure looks a bit silly with that big rocket, so I will display mine without it. 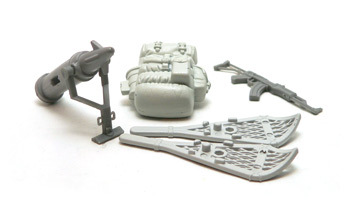 Rounding out the accessories is a grey molded AK-47 variant. This one appears to have a metal stock, as opposed to a wood one. Makes sense for a paratroop. This is one of those figures that should make kids and collectors happy. The figure manages to update the look of the vintage figure, while being a something kids would be interested in. I think anytime you have a generic soldier figure in a line, even a specialized one like this, it’s a pretty good bet it will be a hit. Faceless soldiers are great army builders. I was very surprised any of these made it to the clearance aisles. Excellent figure, but yes, the teal bits are kind of distracting. Sweet amount of extras, though. 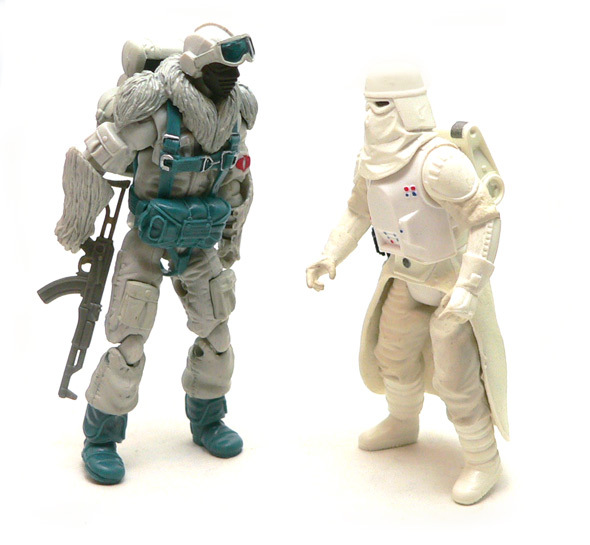 Really the fur arms bother me a little more than the teal, but still better than a number of Star Wars figures I can think of.